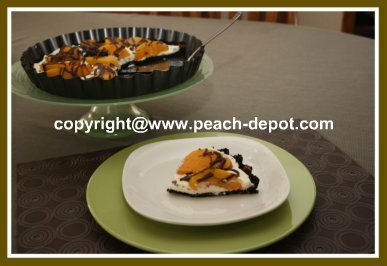 This Easy Dessert Recipe for CANNED PEACHES makes the best No Bake Peach Flan with a crumb crust and drizzle of chocolate! This elegant dessert only looks difficult to make ... but it is actually so simple to prepare it will become a favourite! 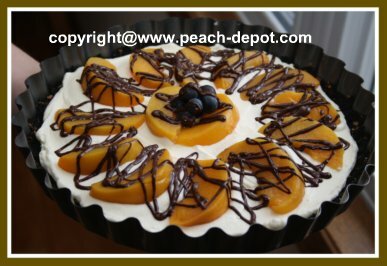 I made this Peach Flan yesterday, and my family raved about how scrumptious it tasted! Why not treat your family and friends to this delicious treat? If you are fortunate enough to have fresh peaches on hand, they will work equally as well in this recipe. In a small bowl, combine the crumbs, butter, granulated sugar and chopped almonds, until well mixed. Press mixture evenly into the bottom and up the sides of a 9" (23 cm) flan pan, or pie plate. Bake at 375° for 8 minutes. Cool. In a medium size bowl, with an electric mixer, beat the softened cream cheese, icing sugar and the almond extract until smooth. Gradually beat in the whipping cream and continue beating until stiff peaks form. Spread evenly into the cooled crumb shell. 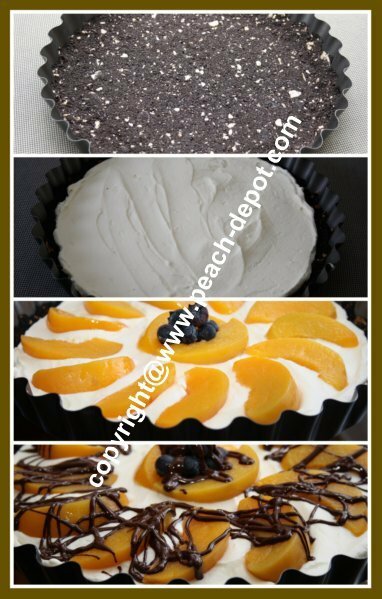 Arrange the peach slices decoratively on the surface of the filling. You can add additional fruit such as blueberries, or raspberries as garnish, if desired. 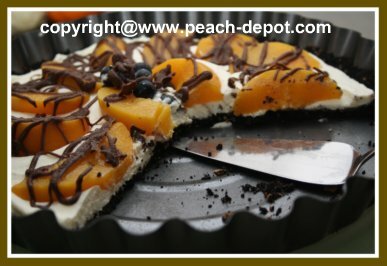 Make a tiny cut in the bottom corner of the plastic bag, and drizzle the chocolate over the peaches (see picture). Chill until set, at least 1 hour. Enjoy this Simple Dessert Recipe for Canned Peaches! 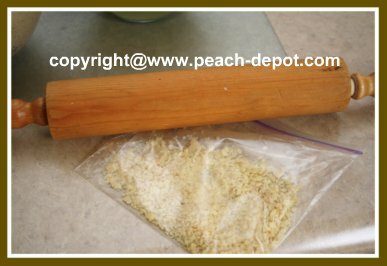 To make finely chopped almonds, place almonds in a small plastic bag, or in between waxed paper, and crush almonds with a rolling pin (see picture below).